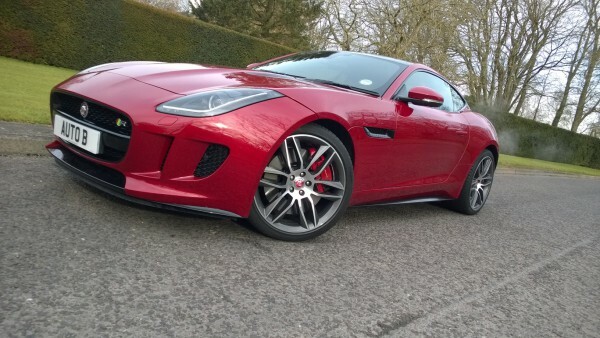 Time Well Spent: Jaguar F-Type R Coupe. The £86.000 Jaguar F-Type R Coupe. A wannabe E-type or a modern day XJ-S were just some of the comments that were banded around in my earshot when sampling the top of the range Jaguar F – Type Coupe. As you may remember, we experienced the 3.0 supercharged S back in the summer and came away feeling impressed and proud to be British. Styling is always objectionable but I found the sporting Jaguar to be achingly pretty and it commands attention pretty much everywhere you go – the nice kind and right kind of attention too. All in all, I loved every moment be it behind the wheel or stood looking at it from a small distance. So when the chance to grab a steer of the V8 powered two seater came about, the chance was not to be turned down. The 3.0 V6 Supercharged car I last drove had 380Ps under the long and curving bonnet, but now I was to be holding the reigns if you like to a 5.0 V8 working with a twin scroll supercharger. The end result is a car that looks almost similar to the “S” model in every way but with an almost offensive amount of power – 550Ps. It would be fair to say that in the right hands it will arouse surprise and reward and in the wrong hands… become rather frightening! The British made 5.0 V8 features a twin scroll super-charger and punches out a colossal 550Ps with a disturbing 680Nm of torque – It sounds amazing! From the moment you prod the console mounted button to fire up the V8 plant, you just know you are in for one hell of a ride. The woofle and gurgle cannot be described in words alone so lets just say it’s a good sound but it’s a loud one too. Like many, if you leave for work early on a morning, you may see the odd curtain twitch – I certainly did but the comments afterwards tended to be “wow that sounds good”. Once warmed through the 5.0 V8 settles to a flawless thrum on idle with an incredible lack of vibration in the body shell or cockpit. So what’s the difference over the 3.0-S? Well… its mainly power and noise – and lots of it too. Where the “S” is smooth and very easy to drive with effortless linear performance, the “R” begs to be driven hard from the off. You have to master the throttle pedal with skill and precision at first but once accomplished you soon become at one with the Jaguar, it’s not a vehicle for the faint hearted. 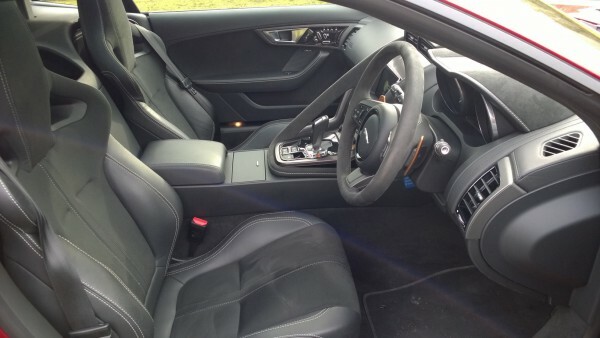 Progress around town is pretty good and even though the ride comfort is very much on the sporting side, for a car with seemingly zero suspension movement, Jaguar engineers have given it just enough comfort. 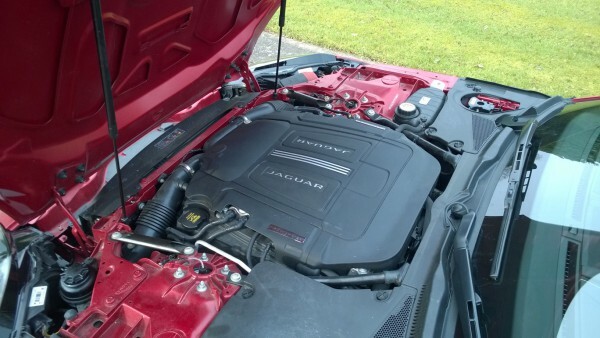 Its a snug fit but the Jaguar offers all the fittings expected in this class. The heated and cooled seats have every possible range of adjustment and are ultra supportive. Cruising refinement is excellent and the ride comfort is very sporting but on the right side of acceptable for long distance touring. Obviously, deep potholes and ruts need to be avoided and if they’re not the Jaguar will hop and jitter around – especially under power. But build up the pace on a nice road and the F – Type remains in control and actually quite refined with what a few passengers remarked as a decent ride comfort. But to talk about ride quality too much would be foolish – if you are after a quick Jaguar to pop up to the shops in or to enjoy the serene comfort of a luxury car… why not try the XF-R for size. The F-Type R is a long distance point to point missile. On the subject of “does it go Mister?” as a young lad said recently, Jaguar claim it will pass the 60 mark in around 4.0 seconds and spear on to a limited maximum of 186mph – I have no cause to doubt them. But it’s not so much the numbers but how it does it. In full auto mode the F will make you scream in either fear or delight, drive in manual paddle shift and your abilities can be tested to the limit. The speed of the gear changes and the way it devours time and distance is astonishing to experience, the power is there at any speed and in any gear… it really is something to witness or experience. The F-Type has enough space for a pair of suitcases in the boot. In the front there are some sensible cubby holes and a good sized glovebox too so it’s not just your style than won’t be cramped. The handling is electric thanks to tyre equipment wider than a Barford Road roller, brilliant steering feel thanks to a conventional hydraulic PAS system and gigantic fade – free brakes which are progressive and well specified for the power. Cornering at speed brings a steering turn-in that’s sharper than anything a Sheffield Master Cutler could produce. For sure, if you tickle the throttle the Jag wags its tail like a spirited Labrador puppy but it’s all consummate to the colossal power the car produces. Nor does it feel out of its depth either, it’s well balanced in every scenario it’s put through. Switching on the aptly titled “Dynamic Mode” sharpens up the steering and damper settings and by turning on the “Active Exhaust” which by-passes the exhaust flow through the rear silencers, your world becomes tinted with a hint of red mist. The bark and over-run pop from the quad slash tail pipes took me back to the time I first heard War of the Worlds via a premium Hi-Fi and Wharfedale E70 speakers… absolutely spellbound. The noise can get tiresome after a while, and when it does, you simply turn the function off and it all goes serene once again. For the money asked, it could do with one or two improvements in quality. 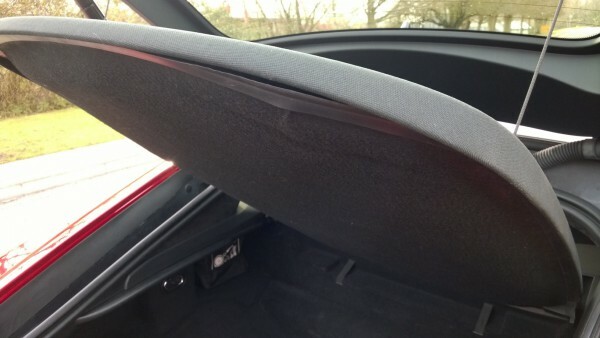 Some of the interior is at odds with a vehicle of this cost and the parcel shelf on the test car was looking sorry for itself. As with the 3.0-S, a cute little boot spoiler automatically pops up at higher speeds and lowers again once you slow down to landing speed. All in all, the 5.0-R is a devilishly great touring speedster which is sadly wasted in the UK, for nipping over to the Austrian Alps for a fondue party or flying down to Monte-Carlo for a friend’s boat christening the F-Type R would excel. 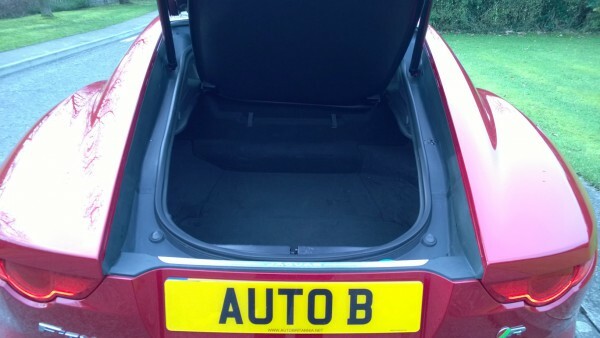 The boot will fit in a brace of cases and there are some neat little pockets and spaces for odds and ends – a whole lot more than you would find with the cabriolet version, and with a much better ride. Excluding the options, the 5.0-R relieves the potential customer of £85.000 excluding options which may seem a lot to pay. But you gain genuine supercar performance with superstar looks and a voice with more substance than Tom Jones – everyone who viewed and sampled the car remarked on how great or cool it was. Tail sliding, tyre burning, laugh out loud fun or high speed long distance leather and suede trimmed GT opulence… as Blind Date’s “Our Graham” used to say – the decision is yours! Not only is the F an incredible machine, its also a work of art. It looks pretty and aggressive in equal measures with plenty of minerals to either reward or relax the driver. Once the power and the sharpness is mastered, the car is equally at home on opposite lock or on the opposite side of the road cruising along the European roads. Does the extra expense over the 380Ps V6 model make a case for itself? That’s a tough one as the V8 sounds utterly superb in side or outside the car and offers even more performance than before. But it’s not enough to justify the extra money as I feel this 550Ps machine is wasted on our dreadful congested British road network. However, if you regularly travel far afield into Europe or have access to your own race-track, it just has to be done… you cannot beat the sound of a supercharged V8. Also, averaging just over 20mpg, it’s not that bad on the fuel considering the utterly Earth shattering performance. All it needs its a nip and tuck in the quality department to really really stand proud, we like the F Type for its ultra cool looks and scintillating road manners but we reckon the 3.0 V6 S is the one to go for if you are wearing your sensible head. Equipment Highlights: Leather trim with hand stitching detail – Upgraded brakes – Cruise control and speed limiter – Bi Xenon headlamps – 20″ alloy wheels – Sat Nav / Bluetooth & Multi media system – Automatic climate control – Reverse parking camera – Quad tailpipe and adaptive sports exhaust – Electronic active rear differential – Configurable interior mood lighting. THE HIGHS: Awesome performance – Superb styling cues – Terrific handling and grip – Engine soundtrack – Off boil refinement – Comfy and supportive seats – Attracts admiring looks everywhere you travel – A credible piece of British design and ingenuity – The modern face of a forward looking Jaguar – A truly stunning and capable machine. THE LOWS: Adaptive exhaust can get tiresome and embarrassing in certain environments – Expensive in R form – Some quality improvements needed to bits of minor trim – Needs to be driven with absolute care until used to – Lesser models make better sense finance wise.